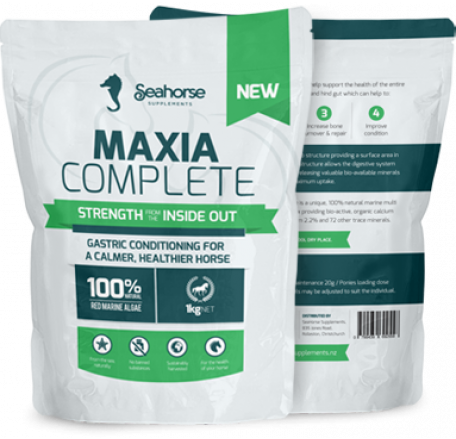 Maxia Complete is a safe and 100% natural marine nutraceutical supplement for horses derived from calcareous red marine algae. Maxia Complete is a unique, 100% natural marine multi mineral complex providing bio-active, organic calcium 32%, magnesium 2.2% and 72 other trace minerals. "I was lucky enough to be one of the first people to trial Maxia Complete before it was released to the market. The results I have seen on so many horses have been outstanding, I now run my entire team on it! I also love the fact the Maxia have New Zealand based research to stand behind their product. I wouldn’t be without Maxia". "We have a broad range of horses and ponies in work; top level showjumpers, ponies, racehorses, youngsters and I often work with client’s horses with behavioural issues. 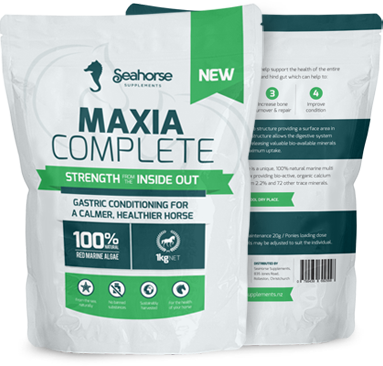 We have been using Seahorse Supplements Maxia Complete for several years now and I have found it to be a real problem solver in many situations. Not only is it a natural product that targets ulcer problems in stressy horses, it also improve their coat condition, appetite and general behaviour. I have tried many different products over the years, but I find Maxia gets the results at a cost effective price! " "We've seen the results using Maxia Complete, the team are eating, racing and recovering better"